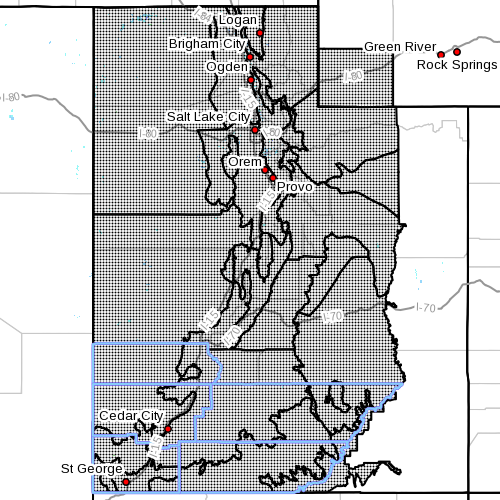 SOUTHERN UTAH – The National Weather Service in Salt Lake City has issued a “Special Weather Statement” for Washington, Iron, Kane, Beaver and Garfield counties Sunday, advising motorists planning to travel for Thanksgiving to consider traveling Tuesday ahead of the storm. Logan, Smithfield, Brigham City, Ogden, Bountiful, Salt Lake City, Tooele, Lehi, Provo, Nephi, Wendover, Snowville, Huntsville, Park City, Heber City, Woodruff, Randolph, Alta, Brighton, Mirror Lake, Highway, Scofield, Duchesne, Roosevelt, Price, Castle Dale, Emery, Green River, Hanksville, Manti, Richfield, Delta, Fillmore, Beaver, Cedar City, Milford, St. George, Kanab, Escalante, Bullfrog, Cove Fort, Koosharem, Fish Lake, Loa, Panguitch, Bryce Canyon and Evanston. Wintry weather looks to return to the region Wednesday, a day ahead of Thanksgiving, according to the National Weather Service. 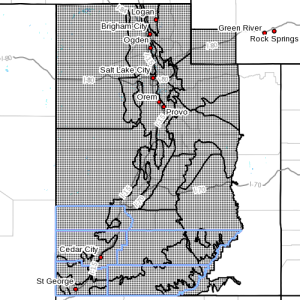 This could cause significant travel impacts across much of Utah, including the Interstate 15 corridor and Interstate 80 across Utah eastward across Wyoming. If your travel plans are flexible, consider traveling Tuesday ahead of the storm. UPDATE: 3:55 p.m. – “Some uncertainty remains regarding the onset of snowfall, however at this point it appears late Wednesday morning through Wednesday night will be the period of greatest impact,” according to the National Weather Service update. Additional winter weather is possible over the weekend. Those with holiday travel plans are encouraged to monitor the weather forecast for updates and plan travel accordingly. Roads will be slick and visibilities may be limited. Use caution when traveling, especially in open areas. Driving conditions may be hazardous. Use caution. Keep a winter storm survival kit in your vehicle in case of an emergency.